The Scandinavian country denied her application for asylum. 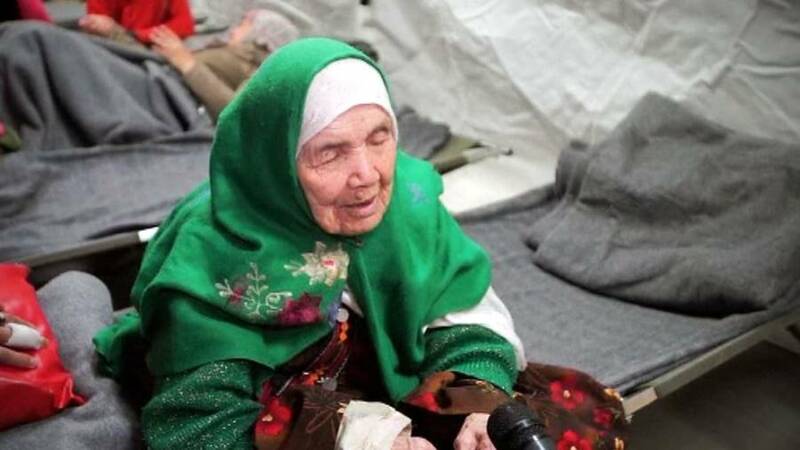 The Swedish Migration Agency has denied the asylum application of a 106-year-old woman, believed to be the world’s oldest refugee. Bibikhal Uzbeki, an Afghani woman, has been living in the Swedish city of Skaraborg for the past year and is blind and confined to a bed. In 2015, Uzbeki fled her hometown of Kunduz, Afghanistan with her family in order to escape the increasing Taliban influence. After traveling through Iran, Turkey, Greece and Germany she arrived in Croatia, and was sent to a refugee camp in Opatovac, near the Serbian border. She then moved with her family to the camp in Skaraborg. Due to her age, Uzbeki relied on her family to support her along the journey. At times, her sons even carried her on a stretcher across rough terrain. “It was a difficult journey for the whole family. We carried her until we reached Germany, there a doctor finally gave us a wheelchair,” her son Mohammed told a Swedish newspaper. Uzbeki’s asylum request was rejected in June, on the grounds that her hometown was now safe enough for her to return to. Since 2001, Uzbeki’s hometown of Kunduz, Afghanistan has been a war zone. During the reign of the Karzai administration, Taliban forces took hold of the town, and have been fighting with Afghan officials over the land ever since. The war not only created turmoil on a global political scale, but also forced hundreds of thousands of civilians, like Uzbeki, into seeking refuge in foreign nations. Uzbeki has been given the option to appeal the decision in front of the Migration Court, but the decision is unlikely to change. Sweden was once at the forefront of the refugee crisis, taking in 650,000 refugees in the past 15 years, 163,000 of those last year alone. However, their humanitarian efforts soon became a national crisis, as the country’s ability to resettle the immigrants they were taking in began to wane. Immigrant camps that were once top of the line turned to ghetto-like suburbs, as employment rates dropped for immigrant families. In February, riots broke out in Stockholm over the treatment of immigrants and the conditions of the immigrant communities, and Sweden’s National Police Commissioner went on national television to beg for assistance from other nations. Since the riots began, asylum seekers who were denied their requests have gone into hiding, simply refusing to leave the country. The head of terrorism research at the Swedish Defense University Magnus Ranstorp said roughly 12,000 of those who were denied requests have gone underground in an attempt to remain in the country. He explained that while they know they can’t keep all of the refugees, there is a downside to turning them away.